My family and I are Orthodox Christians, this seems to me is something coming from the Islamic beliefs. 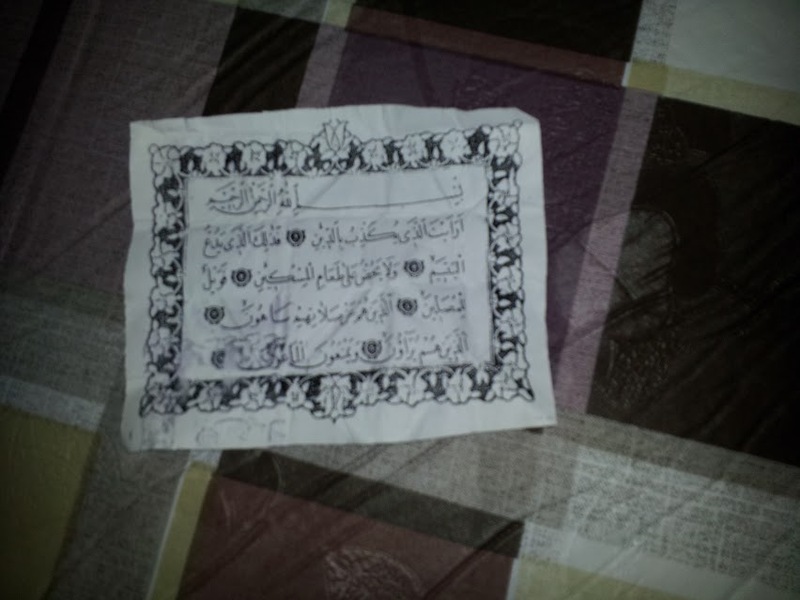 We are very confused how this got inside the pillow and most importantly can somebody tell me what to do with it, what the text says on it, and what the flower frames means? Recently I was in a accident that left me paralyzed; is there any relation to this message. It sounds crazy, but I'm just saying. Have you seen the one who denies the Recompense? For that is the one who drives away the orphan And does not encourage the feeding of the poor. So woe to those who pray [But] who are heedless of their prayer - Those who make show [of their deeds] And withhold [simple] assistance. A tafseer (interpretation) of the sura is here. There is other interpretations and translations; see this: Why are there different translations of the Quran? What does the flower frame mean? It's just some flowers used for decoration! Not every mushaf (Quran book) has the same decoration, a lot of them without any frames; these are all just used for decoration. Some others used for make reading more clear, like circles with number of verses, and some other symbols. You can keep it. The letter of the Prophet (peace be upon him) to Hercules contained a Quranic verse here. From this scholars said that non-Muslims could keep Quranic verses, but please endeavour to respect it and keep it in a clean place, and try to don't put anything on it. If you don't want to keep it, how to dispose of it? Well the khalifah (king of muslims) othman r.a when he wanted to dispose of some qurans copies because of some reasons, he ordered to burn them, from this scholar said that you have to burn it. I read in a fatwa that you can also also shred it with a paper shredder. Is there any relation between this message and my accident? If you find this crazy and could not come to your pillow in a normal way, none can know the relation or the reason but you. Try to read the translation of the verses and some interpretations. If there is a message related to you life, you will incha'allah find it. If there is no message or relation, take this chance to read more about Islam, feel free to ask here about anything. Not the answer you're looking for? Browse other questions tagged quran-translation arabic-translation tawiz or ask your own question. What is the English meaning of this verse? What is the meaning of سعدیک and و الشرّ لیس الیک in this prayer of Istiftah? What is the english meaning of taqwa?